DAVE stands for Definitely Affordable Virtual Environment. Affordable means that by mostly using standard hardware components we can greatly reduce costs compared to other commercial systems. Also, by exchanging just the graphics cards every couple of years and less frequently the PCs we can always use the latest graphics hardware for little money. Optimally using the available space we use a normal existing room without constructional changes. In 2005 we built the DAVE here in Graz, Austria. 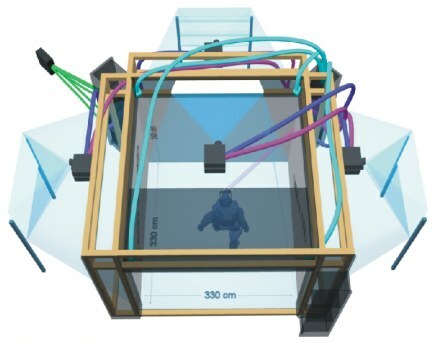 This type of immersive display is the best way to explore virtual worlds in a natural way. An alternative technology is the Head Mounted Display which may be uncomfortable to wear and typically has a lower resolution and field of view. However, the DAVE setup requires a large room and some effort. Images are projected on the back projection side walls and on the floor from above. We use mirrors to reduce the space needed. There are two main technologies why the DAVE is so convincingly immersive. One of them is stereoscopic vision. Each eye sees a slightly different image. This is done by using two projectors for each wall, showing images for the left and right eye alternatingly. The user wears lightweight LCD shutter glasses that are synchronized with the projectors. They are only transparent on one side at a time so the user can see the respective image. Stereoscopic vision: left and right eyes see slightly different images. 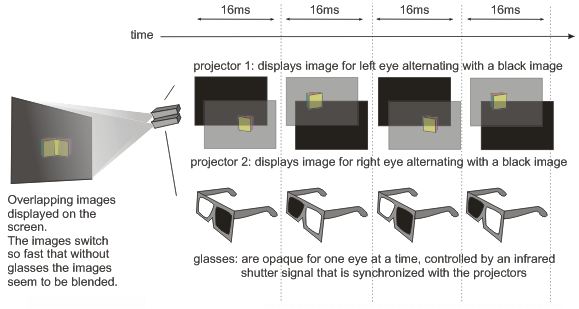 Time interlaced projection with shutter glasses for stereoscopic vision. The second important part is motion parallax with the help of head tracking. Depending on the user's eye positions, the image is rendered from the according view. As an example, the user can just move his head sideways to look around a corner of the virtual world. The optical tracking system uses infrared lights and cameras that can detect little retroreflective marker balls. With triangulation their 3D positions is measured. A fixed constellation of markers enables identification and measuring the orientation of an object (the stereo glasses, a game controller, etc.). Motion parallax: when moving the head, the scene content changes accordingly. Time: Thursdays, 4pm (except holidays). Location: Inffeldgasse 25E, first door on the left. The Davelib is our minimalistic virtual reality framework for OpenGL-based applications. A user in the DAVE, exploring the National Library in Vienna, Austria. Wearing 3D glasses the user is immersed in the virtual world.